Study the biology, chemistry, geology, and physics of Earth’s oceans and coasts. We offer interdisciplinary training at facilities in Athens and the Skidaway Institute of Oceanography, and provide research opportunities on local and global issues. The Department of Marine Sciences offers a Ph.D. degree program with concentrations in chemical, biological, geological and physical oceanography. Research opportunities exist across a wide range of topics that reflect the multidisciplinary nature of Marine Sciences. Graduate students in the Department of Marine Sciences are supported by assistantships or fellowships, and the high faculty to student ratio facilitates highly individualized training and mentoring. 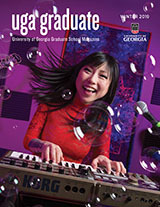 Graduate students have access to the extensive field and laboratory facilities on the UGA main campus in Athens and at the Skidaway Institute of Oceanography in Savannah, the University of Georgia Marine Institute on Sapelo Island, and the Marine Extension Service. Our faculty participate in multi-institutional research programs that provide unique opportunities for student research. Current graduate students are conducting research in marine microbial metagenomics and ecology, organic and inorganic biogeochemistry, marine ecosystems and policy, biological oceanography, coastal circulation and ecology, deep-sea and sediment processes, marine geology, integrative modeling, climate change and others. Reflecting the diversity of our program, our graduates find employment in a wide range of areas, including federal agencies, NGOs, industry and academia.